A custom-built luxurious first floor apartment, completed in 2008. 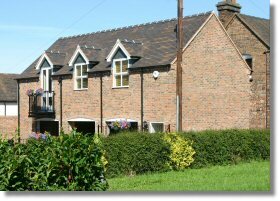 The Coach House apartment can sleep up to 4 people (2+2) and has a fully fitted kitchen, bathroom with bath and shower and living area. Price includes all gas (fully central heated), electric, bedding and towels. 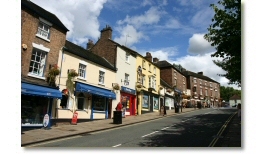 Located just a short walk from Broseley village centre. Couples only, no pets, no smoking. 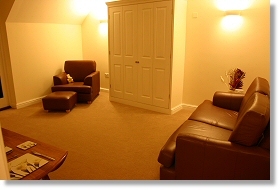 A light and spacious room, fully furnished with leather sofa, chair and footstool. Dining table to seat four with television and radio. French doors open onto a small balcony overlooking the south facing courtyard. The wall bed is neatly enlcosed in a cupboard - see picture at the bottom of this page. 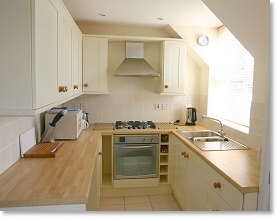 Fully fitted kitchen with tiled floor including gas hob & electric cooker, fridge with freezer compartment, microwave, kettle, toaster, iron & ironing board. 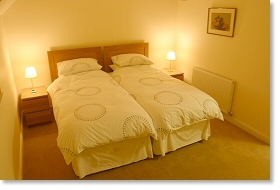 Large double room with twin or super kingsize bed. Built in wardrobe and storage. 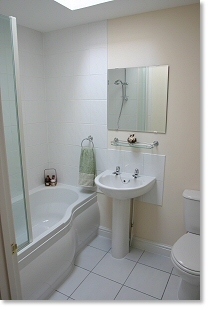 Fully fitted with Bath, shower, basin, toilet, large mirror and radiator. Tiled floor and large skylight bringing in natural daylight whilst remaining private. A double Wallbed is concealed behind bifold doors in the living area. Hinges down from the wall to give a full size double bed. All bedding remains inside.